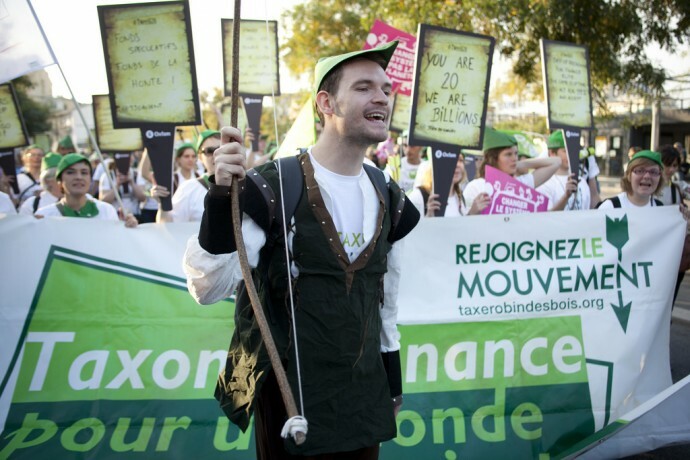 Cannes (4 Nov. 2011) - International campaigners for the Financial Transactions Tax (FTT) or the Robin Hood Tax are reporting considerable progress coming out of the recent G20 meeting in Cannes, France. French President Nicolas Sarkozy announced that South Africa, Brazil, Argentina have joined those already supportive - France, Germany, Spain, the European Commission, the African Union and the Secretary General of United Nations (UN). Sarkozy hopes to see movement towards the implementation in early 2012 and added that a proportion should be linked to development. In response, Max Lawson, a spokesperson for Oxfam UK's Robin Hood Tax campaign, said, “We are delighted that a growing group of G20 nations from Brazil to Germany to South Africa have answered the call of millions who want the financial sector to contribute to the fight against poverty and climate change." James Clancy, National President of the National Union of Public and General Employees (NUPGE), sees this as a clear message to the Harper government and Canada's financial sector. "While there was not unanimous support for the Robin Hood Tax at the G20 our Prime Minister must be feeling increasingly isolated in his opposition. Canadians want this country to champion international measures that will help the poor and fight climate change not lobby on behalf of the financial sector." "Also, while our banking sector may have faired better during the recent economic crisis, people are starting to demand that they start paying their fair share!" Many point to the report prepared by Microsoft founder Bill Gates as a game changer at the meeting as it confirms that countries, as several have already done, can go ahead and proceed with implementing their own FTT. Clancy added,"With the increasing threats to the global economic system, world leaders must act to fix the system. The Robin Hood Tax, by curbing casino capitalism, can be part of the way forward."